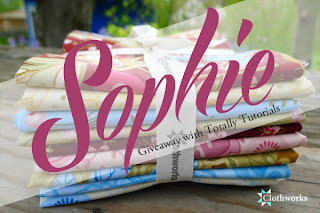 Clothworks is offering fat quarter bundles of their Sophie line to 6 tutorial makers. The tutorials will be promoted by Clothworks, and posted here on Totally Tutorials. The sign up is on their blog. They will randomly draw 6 people out of a hat to be the tutorial makers, send you all the fabric and then you’ll be on the hook to make some kind of tutorial on your blog or elsewhere. To find out all the details, click here but hurry, the drawing ends Thursday, May 30th at midnight.